The Tory leader spent the summer crossing the country on an introductory tour. Conservative Leader Andrew Scheer talks with media in Ottawa on June 21, 2017. OTTAWA — A selfie with a camel. Snapshots of cherub-cheeked children looking on in awe at some summertime marvel. Photo captions paying tribute to the support of his spouse. Prime Minister Justin Trudeau's summer on social media? Nope: think Conservative Leader Andrew Scheer instead. Make no mistake, the Conservatives are hoping to beat Trudeau come the 2019 election, and if there's one thing they're conceding it's that doing so requires being a little more like him. "I'm not going to try and get even flashier socks that he has to make an impression on social media,'' Scheer joked in an interview. But what Scheer is aiming for when Parliament resumes in a couple weeks is to lay the groundwork to convince Canadians that he can provide an alternative. 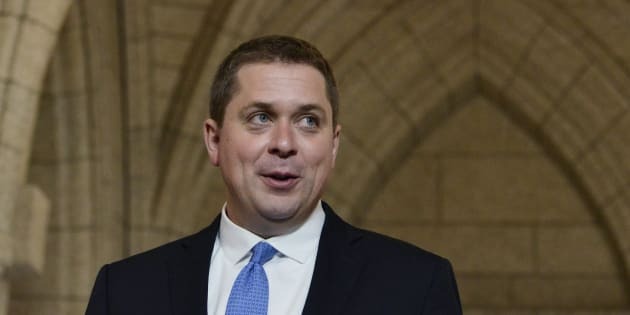 Conservative Leader Andrew Scheer spent the summer crossing the country as an introductory tour following his squeaker of a victory in the party's leadership race last May. "I think at the end of the day if voters don't see the substance and the merit of the policies you're advocating, it won't matter what you do on social media,'' he said. Scheer's spent the summer crossing the country as an introductory tour following his squeaker of a victory in the party's leadership race last May. It was a way to gather fodder for the Conservative strategy machine that gears up in earnest in Winnipeg on Wednesday with a multi-day meeting of Conservative members of Parliament, senators and staff. The summer has provided no shortage of ingredients for Tories to chew on. A $10-million payout to Omar Khadr, the Canadian accused of killing a U.S. soldier and wounding another in a firefight in Afghanistan, but whose rights were found to be violated by Canada's top courts, leading to the settlement. A surge of asylum seekers overwhelming resources at the Canada-U.S. border raising fears about the integrity of the Canadian immigration system. Then there was there was a decision by the Liberal finance minister to launch consultations on tax changes aimed at closing loopholes used by a growing number of small businesses, which the Liberals say create an unfair playing field. The backlash to that has been sustained, with companies bristling at being accused of cheating when what they say they're trying to do is manage their own affairs. Liberals themselves are getting an earful and the issue is top of their own caucus meeting agenda this week. The Tories are hearing the same complaints, Scheer told a meeting of his shadow cabinet in Winnipeg Wednesday, and yet Trudeau refuses to back down. Conservative Party of Canada leader Andrew Scheer speaks, as Lisa Raitt, Alain Rayes, Candice Bergen and Chris Warkentin listen in, at his shadow cabinet meeting in Winnipeg on Wednesday. "While Justin Trudeau focuses on the issues that divide his own party and pit one Canadian against each other, we will be focused on improving the quality of life for all hardworking Canadians,'' he said. While Scheer is the party boss, leading the charge on the finance front for the Tories will be critic Pierre Poilievre, named to the post last week when Scheer unveiled his shadow cabinet. The team is a mix of old faces and some newer ones, and of course Scheer has incorporated some of his rivals for the leadership bid, including Maxime Bernier to keep watch over the innovation file and Erin O'Toole on the foreign affairs front. The shadow cabinet will brief the rest of the Conservative team on their files beginning Thursday and there will be regional break-out sessions and also updates from local conservatives on the political landscape in the province. Winnipeg's meeting is just the latest caucus gathering to happen far away from the power nexus of Parliament Hill; taking the Tories on the road instead of behind closed doors was a signature move for Ambrose as she sought to rebrand the party as one of openness and inclusion. Scheer's work in that regard comes at a challenging time. Many Liberals say that as long as Donald Trump is the U.S. president, Canadians will want Trudeau in power. And Scheer has already found himself on the defensive over criticism that Canada's conservatives risk hewing too closely to the extreme right backing Trump. Scheer cut ties with the Rebel after pressure, but the Liberals have tried to keep the issue alive, pointing out late last week that ads for the party were still appearing on Breitbart, an American conservative news site run by Trump adviser Steve Bannon. Scheer said he is sure the Liberals would like Canadian voters to associate the Conservative leader with Trump, but he points out that Canadians won't be voting for a Trump in the next election.